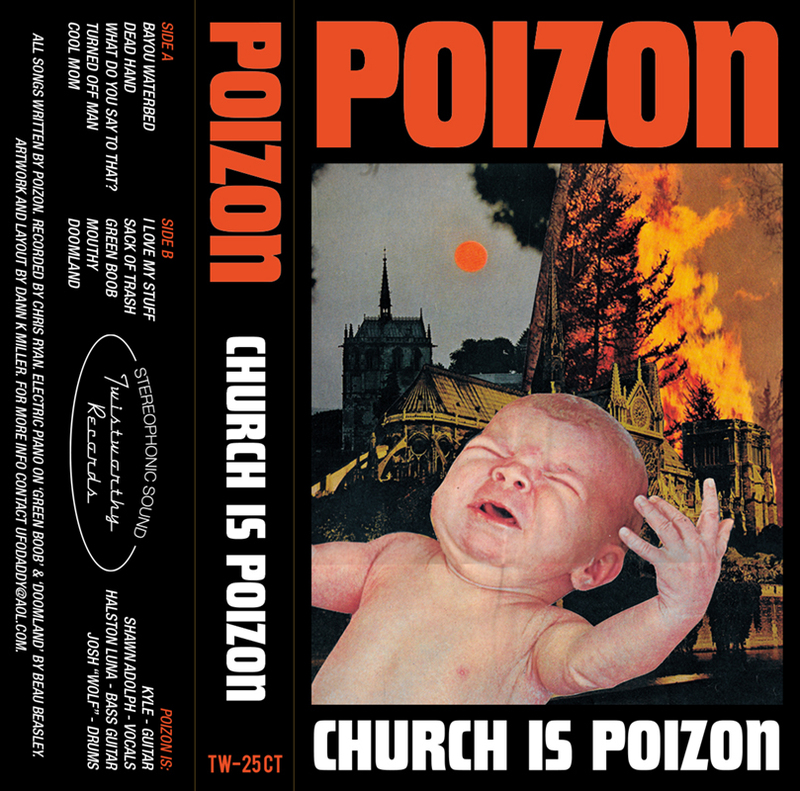 Poizon's first LP, titled "Church Is Poizon", manages to forge together the creepy LA punk of the late 70's/early 80's mixed with 80's Australian swampy garage rock, meeting up for a rendezvous in the bayous of Houston. Comprised of Shawn Adolph (THE FATAL FLYING GUILLOTEENS, WEIRD PARTY), Kyle Gionis (SUGAR SHACK, WEIRD PARTY, WELFARE MOTHERS), Josh "Wolf" (SECRET PROSTITUTES, SNOOTY GARBAGEMEN, THE ENERGY, CRIME WAVE), and Halston Luna, POIZON is subtly punk in a way that many bands can't grasp, remaining completely unpretentious while maintaining an unheralded ability to capture the listeners attention by just, you know, doing what they're doing. I once, in a real life conversation (albeit, likely whilst somewhat inebriated), described POIZON to someone who had not yet heard them as "ok, take a band like Protomartyr and have them throw all of their UK postpunk records by The Fall and Joy Division in the trash, and instead have them draw influence from 80's Australian records by The Scientists (the later, 80's era swampy stuff... Crime & The City Solution or Beasts Of Bourbon would work here too). Then, give this band a shot of 80's Southern California punk energy and unprecedented sense of melody sprinkled over the top, and maybe you'd have something close to what POIZON is doing." WITH ALL ORDERS, you will be emailed a link that you can redeem for a full download of the album. THANKS! 336 copies pressed on black vinyl. 100 copies pressed on black cassette tape.